Every year about this time, we usually experience a really bad event. It is connected to the U.S. chart I follow which is for the signing of the Articles of Confederation ..November 15, 1777..12:44:46 PM York, Pennsylvania. This turbulent time frame is fast approaching again. It is when the Sun reaches late Aries and early Taurus from April 18th -21st. 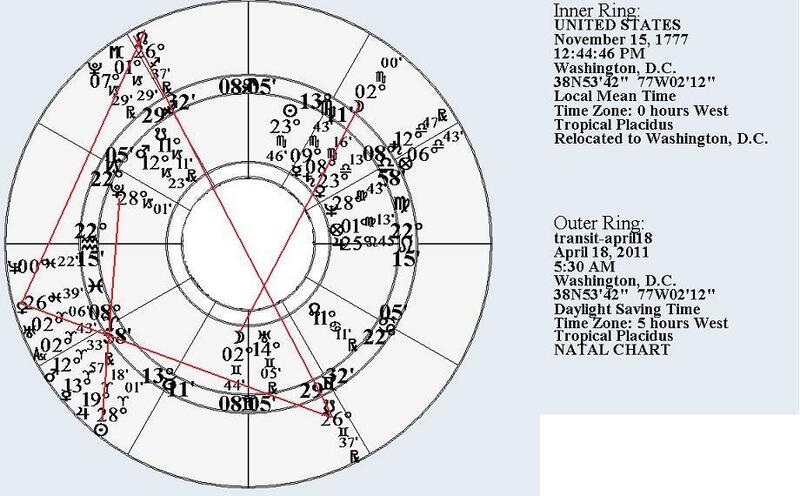 At that time it squares the natal and progressed U.S. Pluto at 28 Capricorn 01 and 01 Aquarius 02R in the 12th house. Here are some of the terrible events that have happened during that time frame down through the years. The 1983 U.S. Embassy bombing was a suicide bombing against the United States Embassy in Beirut, Lebanon on April 18, 1983 that killed over 60 people, mostly embassy staff members and U.S. Marines and Sailors. It was the deadliest attack on a U.S. diplomatic mission up to that time, and is seen by some as marking the beginning of anti-U.S. attacks by Islamic groups. The Oklahoma City bombing was a domestic terrorist attack on April 19, 1995 aimed at the U.S. government in which the Alfred P. Murrah Federal Building, an office complex in downtown Oklahoma City, Oklahoma. The attack claimed 168 lives and left over 800 people injured. Until the September 11, 2001 attacks, it was the deadliest act of terrorism on U.S. soil. The Columbine High School massacre occurred on Tuesday, April 20, 1999, at Columbine High School in Columbine in unincorporated Jefferson County, Colorado, near Denver and Littleton. Two students, Eric Harris and Dylan Klebold, embarked on a massacre, killing 12 students and a teacher, as well as wounding 23 others, before committing suicide. It is the fourth-deadliest school shooting in United States history. Last year we had The BP oil spill which started to unfold on April 20th, 2010 when the Sun squared the U.S. progressed Pluto. This was a horrendous event to say the least! Tomorrow morning (April 18) there is a Grand Square between the transiting nodes, progressed U.S. Neptune,progressed Mercury, and transiting Venus. Wow, that's a lot. Perhaps the daily rising price of gas ties into it. Also with the Mercury - Neptune involvement, the terrible wind and tornadoes in the South the last few days fits in. With also, the New Moon at 24 Aries 27 on the 14th adding its input. These terrible storms killed many people (even tragically, two people that I know here in Arkansas); while those aspects were applying. So, anyway, I will be relieved when the Sun gets past progressed U.S. Pluto on April 22nd. So hold your breath folks and hope for a quiet, peaceful week ahead.